What does the health care system look like to neurologists at the point of care? The picture is one of barely controlled chaos, several told Neurology Today in telephone interviews, where the most abundant and advanced medical technology, administered by the best-trained physicians in the world, is simply not available to a large segment of the population. We have neither a system of universal public health and preventive care, neurologists said, nor a mechanism for delivering care to these patients when they have acute problems and chronic diseases. What exists instead is a confusing, often inscrutable patchwork of hospitals, providers, and payers that increasingly fails to serve the public. It is a system that thwarts the best intentions of physicians striving to serve patients' needs, they said, under conditions where access to tests is inadequate and compliance with medications is made financially impossible. This frustration affects neurologists perhaps more than most physicians, as they deal disproportionately with patients whose chronic problems impoverish themselves through the disabilities they create. Although neurologists differ on how the American health care delivery system can be fixed, few disagree that the system is broken. According to the January 2006 report by the Kaiser Commission on Medicaid and the Uninsured, more than 45 million people lack insurance — 18 percent younger than 65. This sector has grown by 11.2 percent since the year 2000. While this crisis affects lower-income working families disproportionately, a 2005 Commonwealth Fund survey revealed that two of five working age Americans — with annual incomes between $20,000 and $40,000 — were uninsured for at least part of the preceding year. Furthermore, it revealed that another 16 million are underinsured due to gaps in coverage that create obstacles to care. For these populations, medical care is, at best, catch as catch can. For children, public health programs try to pick up some of the slack, but are often unable to provide much needed services due to already strained financial resources. Susan T. Iannaccone, MD, a Dallas, TX, child neurologist, has been treating twins with limb girdle dystrophy who have severe weakness and have been gradually deteriorating due to progressive orthopedic deformities — scoliosis, torticollis, and equinovarus of both feet. They now need corrective foot surgery, but fail to qualify under their Medicaid plan for the 24/7 post-op nursing care they will need. In fact, quite a few neurologists would like to see every American covered in a single payer system, although they differ on who pays, or how this might be achieved. Some would like to use a national health plan like that of Canada — organized and funded by the federal government. Others favor universal health coverage as long as the private system as we know it would remain in place — envisioning a single player similar to Medicare administering the plan, but with physicians as free agents rather than government employees. Still others advocate that universal coverage be achieved on a state-by-state basis, with the coverage and funding mechanisms determined at a state level. Even state proposals vary as to their models for financing. Some call for a single payer system from a publicly administered pool of money, while others require that citizens purchase private insurance or be taxed for it. Lowery L. Thompson, MD, a neurologist in Monroe, LA, since 1985, said he has always believed in universal health care. He expresses his views to politicians, but he also walks the walk. Over the past 18 years, he has been running a free clinic in this Mississippi delta area, where 40 percent of the population is uninsured. Dr. Thompson contends that universal access with preventative services would ultimately result in savings and prevent much unnecessary duplication of services and care. “Neurologists care for many people who lose the ability to care for themselves and their families; this makes us especially sensitive to this issue,” he said. Neurologist David A. Green, DO, who is a member of a 22-person practice in Farmington Hills, MI, agrees. The Vice President of MichUHCAN, www.michuhcan.com, a statewide network promoting comprehensive health care, asserts that we have the wrong paradigm for health care delivery in this country. “We treat health care as a commodity for sale, rather than as a public good (such as education, police protection, and the fire department) to which everyone is entitled,” said Dr. Green. He views the high cost of prescription drugs in this country as one reason our system is inefficient. “The cost of prescription medications in Canada and most European countries is almost half as much as here in the US,” he explained, “largely because the single-payer insurer in those countries negotiates prices with the pharmaceutical industry.” He added that much of the waste goes to marketing and advertising in this country, not research and development as the pharmaceutical companies would like us to believe. In fact, many of Dr. Green's patients admit that they cross the river to Ontario to buy their medications at half the price. San Francisco neurologist Robert B. Layzer, MD, said that his support for universal health care developed slowly, but he can't respect any other political stance on this subject now. Medical insurance was just beginning when he graduated from Harvard Medical School in 1957, but as he witnessed the rise of medical expenditures followed by the influx of managed care, and compared it to programs in other countries, he began to think our solutions were flawed. “The US has the highest per capita health spending of the industrialized nations — 14.6 percent of the gross domestic product, the next is Switzerland with 11.2 percent, then Germany with 10.9 percent,” Dr. Layzer pointed out. “The only explanation I can see for this huge difference is that our system is being looted by insurance companies,” he added. Dr. Layzer believes that the best bet for reform lies at the state level. He hopes that SB 840, the California Health Insurance Reliability Act, www.healthcareforall.org/summary840.pdf, a bill before the California legislature, will provide the answer by eliminating insurance companies and ultimately spending less money than is currently spent. Similar bills have been proposed in other state legislatures. The Wisconsin Health Security Act proposal, www.wisconsinhealth.org/wiplan.html, is being co-authored by Charles P. Benedict, MD, (D-WS), a retired neurologist who believes that the total cost to his state would be less than the fragmented mosaic of the current health care provider mechanism. He said that neurologists in particular would benefit from a single payer system that levels the playing field, reimbursing for time-consuming cognitive services at a more appropriate rate. “Current reimbursement discrepancies among specialties are frustrating,” said the neuromuscular specialist from Beloit, who admits to missing practice. “And it is simply the right thing to do,” added Dr. Benedict, who is completing his first term in office and intends to run again in 2007. Although he would like to see a nationwide universal health plan, he believes that it stands a better chance state-by-state. Selden E. Spencer, MD, a Democratic candidate for Congress in Iowa, agrees that it is far more realistic to achieve health care reform on the state level. He said that his years of practicing neurology gave him a clear picture of the cost inefficiencies in the current system. “Because the uninsured cannot afford treatment, they end up in emergency rooms, sicker than they would be if they had received proper medical care in the first place,” he said. Dr. Spencer, who has been in private practice since 1990, says that he sees this all the time with his Parkinson disease patients who can't afford drugs and end up in the hospital. But some neurologists believe that there should be a single payer system, not unlike Medicare, that preserves private medicine. The benefit, they say, would be removing the profit going to administrative services at insurance companies. “Medicare's overhead is only 7- to 9-percent, compared to an average of 25 percent with most other payers,” said Paul L. Schraeder, MD, who recently retired from the neurology faculty at Drexel University. His conviction only grew stronger when he traveled to Bay St. Louis, outside Biloxi, two months ago to volunteer at a free clinic set up after Katrina. Next month's In Practice column will discuss how neurologists who have practiced in nations with various forms of universal health coverage feel those systems stack up. 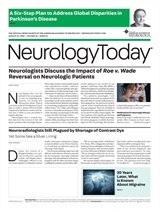 Neurology Today6(16):17-18, August 15, 2006.